Police stand guard outside Asuncion Juanilla Frias' apartment during her eviction in Madrid. June 2015. 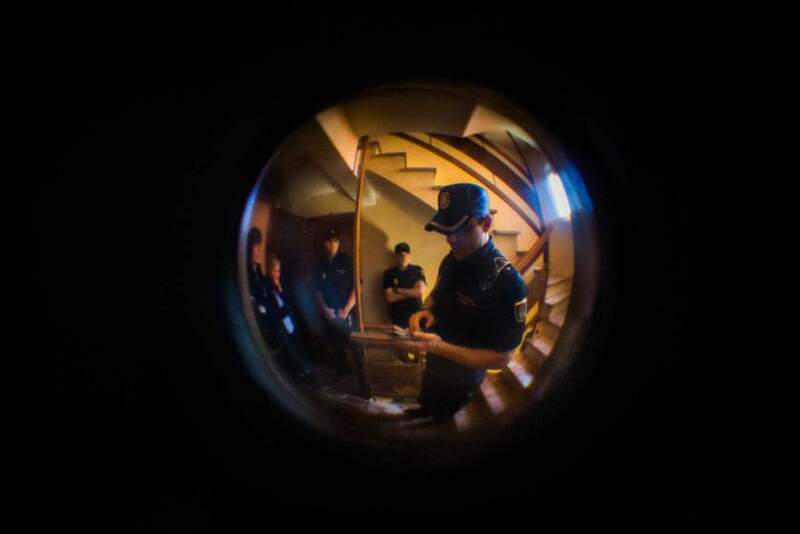 In Spain, few sights are more universally terrifying than that of police through an apartment door peephole. “They’ll come at dawn. They’ll cordon off the area two blocks around the house. And if the residents don’t open the door, they’ll break it down,” says photographer Andres Kudacki. While shooting for the Associated Press in Madrid in 2012, Kudacki embarked on what would become a three-year project about evictions, hoping to tell a deeper story of the widespread, enduring consequences of Spain’s financial crisis. His efforts will find an attentive audience as a featured exhibit at this year’s Visa pour l’Image photojournalism festival in Perpignan, France, at a time when Spain’s economic woes seem all but eclipsed by those of Greece. Kudacki’s photography puts individual faces to a crisis that has seen hundreds of thousands evicted from their homes since the 2008 housing market crash. Spain’s unemployment rate, at 22.5%, is the second-highest in Europe after Greece, and it’s simply impossible for many to make rent or mortgage payments. “Everybody knows someone who’s been evicted,” he claims.